The current printing of Euphoria is pretty much identical to the second and third printings. However, we did add one component: Game Trayz are now included inside the box. You can tell the difference at local retailers because there is a “Game Trayz inside” sticker on the shrinkwrap of this printing. Also, the SKU has changed from STM200 to STM205. The second printing of Euphoria is now available! It is available in Europe in English, French, German, and Czech, as well as in the US. Very little is different between the second printing and the first–there are a few more resource and commodity tokens, and there are wooden stars instead of cardboard stars. Also, 16 of the recruit cards have been updated–these are included in the second printing. These 16 cards are included for free in each Treasure Chest we sell, and they are available through the BGG store for $5. A comparison of those recruits to the originals can be found here. Why Did We Update 16 Recruits? There were a few broken cards (Michael the Engineer and Nakagawa the Tribute) that we needed to fix, along with other cards that were either slightly too good or not good enough. One fairly consistent note is that a lot of cards had a cost of -2 morale or +2 knowledge. We considered them roughly the same in playtesting, but it was revealed when the game hit a much bigger audience that people considered knowledge much more valuable than morale. So we decreased most of the knowledge costs to +1 knowledge. There were also a few cards that had confusing phrasing (people consistently asked for clarification), so we made the cards easier to understand. Other than at the beginning of the game, when do I roll dice (workers)? Retrieving dice from the board (roll only the retrieved dice). Making a new worker (roll only the new worker). Your worker is bumped off the board by another worker (roll only the bumped worker die). Any dice that were on a construction site when a market is completed (roll only those dice). When do I check for total knowledge? Check for total knowledge every time you roll at least one die(see above answer for those times). If there are open spaces on a territory, can I place more than one of my authority tokens on that territory? Can any player place a worker on a standard tunnel action space? Any player may place a worker on any action space on the board (including the tunnels) regardless of their allegiance, with the one exception being the action spaces that open up when a tunnel is complete. The unlocked action spaces are only available for players who have a recruit of faction who controls that tunnel (see the name of the tunnel, e.g., Euphorian Tunnel). On the sixth tier of the tunnel, which recruit cards are activated? Recruits of the faction digging the tunnel are activated (look at the label on the tunnel for clarity on whose faction the tunnel is). If I use my ethical dilemma to draw a new recruit and recruits of that faction have already been activated via the tunnel or allegiance track, is that new recruit activated right away? Yes it is. On a similar note, if the end of the allegiance track for that faction has been reached, it is both activated and receives an authority token right away. What does the “any resource” icon mean on the board and on recruit cards? The “any resource” icon, a 3D cube in the colors of gold, clay, and stone, is seen on the board on some Icarite markets. It means “1 of any resource.” However, there are also some recruit cards that have abilities that activate if you have no resources in your possession–they also use the “any resource” icon to indicate this. Example: Zong the Astronomer says, “When you place a worker on the Cloud Mine, if you have no [any resource] and…” In those cases it should be read simply as “resources”. If I’m being penalized by a market that makes me lose a resource or commodity every time a roll a 4, what happens if I roll two 4s? You’ll lose two resource/commodity tokens. Is the Worker Activation Tank part of Subterra? Nope. The Tank is not aligned to any factions. How many construction site spaces must be occupied by workers to complete construction of a market? This depends on the number of players. For 2-3 players, any 2 spaces on a construction site must be occupied by workers. For 4 players, any 3 spaces must be occupied. For 5-6 players, all 4 spaces must be occupied. Placing a worker on a constructed market to put an authority star on that market (to get out of a penalty): Officially the only way to place an authority star on a constructed market is by visiting the corresponding artifact market. If it works for your group, you could also allow for a player to place an authority star on a constructed market (if it doesn’t already have their star) by placing a worker on that market and paying the cost. This creates more variability in the ways you can get out of a penalty. Focus on one faction’s area on the board when teaching/learning Euphoria to reduce the amount of initial information. Basic theme: You’re a low-level manager in a dystopia, and you’re trying to use your workers to take over. Workers are dice, and the numbers on those dice represents their knowledge. Because it’s a dystopia, you want your workers to be dumb and happy. Win condition: Place all 10 of your authority stars on the board or on your cards, and you win. Turn options: You either place one worker (two if you have a pair–this counts as two separate turns in a row) or remove any/all workers from the board. When you place a worker, you immediately pay the cost and receive the benefit. Overarching iconology: Costs are in grey squares and benefits are in white circles. Types of action spaces: the big box on the commodity areas (multi-use), the dotted line square with an arrow on the tunnels and markets (temporary use), and the solid line box on the construction sites. First turn: Spend your first turn placing one worker on a commodity area and taking the corresponding benefit. Goal for your first few turns: Focus on your active recruit card for the first several turns. This will give you a short-term goal to focus on while you’re getting the hang of the game. Michael loses his ability to advance the Euphorian allegiance track, and he now gains knowledge when he uses gold. The Lounge previously did not allow a player to build a constructed market on their own (if other players don’t help, it becomes impossible for that player to build, which wasn’t our intent), so now that’s possible. It’s just a clarification to the original tile, not an actual change. So, I have: a 2nd edition with new cards, I also have a 1st KS version with the 16 replacement cards. I haven’t had time to fix the KS deck, but when comparing them, I think I found cards that were in the KS that are not in the 2nd edition and 2nd edition cards that are not in the KS or 16 replacement. Very confusing. IS there a single list of cards with functions to positively identify them? Bob: I’m sorry about the confusion, but we haven’t added any new cards–there are exactly 48 recruit cards. There’s only one card that has a name change (Flartner the Scammer instead of Flartner the Luddite), but otherwise all of the names are the same. After I did a through sort of the three decks (KS, 2nd ed replacement, 2nd ed published with game) I figured out the mix. Jonathan the Gambler changed factions and professions; became an Artist. That through me a bit. I’m also posting a picture on FB showing the difference in card material. Now I’m really curious about this, as I don’t remember changing any factions or professions. I’ll look on Facebook for the photo. You are right about the card material, though–we used a different manufacturer for the second printing. Hi, love your work Jamey. Apart from the cards, is there any difference in the second printing of Euphoria? There’s a large difference in price between the 2014 and the 2017 versions and was wondering if any of the resources etc. has changed? Euphoria and the expansion have just arrived. The Gametrayz are great – but as I’ve never played Euphoria before, I’m overwhelmed with the storage options! Where does everything go? If for example the startplayer ends the game with his 10 influence markers, won´t it be fair, that any other player will do another turn to give everybody the same chance? Torsten–The first player doesn’t actually have an advantage over the other players given the way the commodity areas are set up. Also, players place and remove workers so many times over the course of the game, the first player becomes irrelevant. A situation came up in a game, in my turn I had convinced a player to help me build a market (hoping a third person would help). I had two resources and doubles. I placed the first two spots on the market, the next player placed a worker (her only one – an unlucky roll). The other players in order decided not to place. Came back to my turn, now I didn’t have any workers to place so my only two options were retrieve or use my ethical dilemma card. Can you take the retrieve action and not actually retrieve any workers leaving them on the market construction? I would assume you can, but either have to take a morale loss or pay a food or bliss and go up in happiness. Of course the other option would be to abandon the market construction. That’s a good question. I think your answer is at the very top of page 4 of the rules. It basically says you must either place worker(s) or retrieve worker(s) on your turn–you may not pass. And doing something with 0 workers doesn’t count as doing anything (that would be an illegal play). So in that scenario, you would be forced to retrieve one of your workers–potentially from the construction site if that’s your only choice. The one exception is if you use your turn to flip your ethical dilemma. The situation you describe is the perfect time to do that. Without having the necessary cards to complete his Ethical Dilemma how could have been “the perfect time” to flip his ethical dilemma card? Dante: It would have been the perfect time to flip your ethical dilemma card if you had the cards for it. I apologize if I wasn’t clear about that. These rules clearly show that a worker can be removed from a construction site AND a minimum of one (1) worker must be remove during a Retrieval action. So Russell must retrieve 1 or both of his workers from the construction site as his turn since he had no other action available. Curious about the following circumstance. Subterra Reputation is maxed and the Subterra Tunnel is complete. I get a Subterra recruit through an ethical dilemma. Do I immediately flip over the recruit? Do I flip over the recruit the next time Subterra rep is supposed to go up? What about the next time the tunnel is mined? Hi Dan–Sure, you immediately flip that recruit when you gain it if recruits of that faction have already been activated. I think that specific situation is mentioned on page 11 of the rules in the ethical dilemmas section. Thanks! For a recruit that allows you to sacrifice morale or knowledge to the detriment of another player (e.g. “you may lose two [morale]”), is it understood that the player must have at least 3 morale to use this benefit? Hi furmanjon, that’s a good question. I think I mention it on the “notes about recruits” section on page 10 (maybe? I don’t have them in front of me). When you’re spending morale or gaining knowledge as a cost on a recruit’s special ability, you must actually have that knowledge or morale to spend. However, when you are retrieving workers for free, it’s not a cost (it’s kind of a negative benefit), so you can retrieve for free even if you’re at 1 morale. A question about Dr. Sheppard/Pete: if you use them while retreating exactly one worker, do you still have to pay one bliss/food? You don’t have to pay, but if you want to gain 2 morale, you would still have to pay 1 bliss or 1 food (when you retrieve, you’re paying 1 bliss or 1 food total, regardless of the number of workers you retrieve). We ran in to a problem in our first game. It was a 3 player game and all but one building was done solo, with only 1 person putting a star on them. One of those buildings was anyone else without a star can not place in Icarus. With this limitation, two of the three players could not get all of their stars out on the board. It was going to be impossible for them win, unless we misunderstood the rules for putting stars out. The two players were on 2 buildings, 2 for recruits, 1 for the dilemma card, and was able to get on 3 spaces in the areas. Without Icarus, there was no chance of ever placing ten stars. Did we miss something? So in a 3-player game, there are three spaces on each star-shaped territory for players to put authority tokens. That’s part of it. The other part is that players could get out of that Icarus penalty (and place a star while doing so) by placing a worker on the artifact market in the same area as the Apothecary (I think that’s the market with the Icarus penalty). When they place a worker there and pay the cost for the artifact market, they can place an authority token on the Apothecary and no longer be subject to that penalty. You can see more about this in the Artifact Markets section of the rules. Does that make sense? Thank you. I some how missed the artifact area let you place stars on buildings and areas you could not have gone on. Thanks. Does Curtis the Propaganoist lose knowledge even when morale is at 1 when a player retrieves workers from the board? You are correct: For all recruits, to gain the benefit, they must pay the cost or let the thing happen as indicated on the card. In Curtis’ case, if you’re at 1 morale, you can’t lose morale, so Curtis won’t activate. Hi, I couldn’t find the answer to this anywhere, but perhaps I missed it. When activating a worker via the activation tank, you receive a new die and can place it as normal on your next turn. My question is, do you get a recruit card when you activate a worker? Or can you only have 2 recruit cards (or 3 with moral dilemma)? Thanks! Noah–Thanks for your question. Workers (dice) have no connection to recruits (cards). The only way you can add a new recruit card is through your ethical dilemma, and only once per game. You can add workers any number of times during the game, but you can only have a maximum of 4 at one time. Awesome, that’s what I thought and how we just played tonight. I’m going to assume then, that when you activate your moral dilemma card and choose to gain a new recruit, that you do not also gain a worker as well. Thanks again! I have read in some forums that a worker placed on a tunnel with a six showing cannont be bumped from the tunnel I have not found that in the rules, am I missing something? Just Dave: That’s not a rule. :) If you find the forum where you saw that, let me know so I can correct them. Thanks! Can you use a market you did not help build/have an authority point on? Brien–Yes, you can place a worker on a market you don’t have an authority token on. Thanks! When using Dr. Nakagawa, The Tribute, he says after you place a Star on a non Icarite market, you can sacrifice the worker to place an extra star on the corresponding territory. Does this include the artifact market and isnt this ability a bit over powered, especially late game? When using Brian the Viticulturist, can you trade in as many food for bliss, or only one trade per turn? Yes, that ability works on any non-Icarite market. Some recruits are better in the early vs. late game–therein the choice at the beginning of the game to decide your active and hidden recruit. You can food for bliss as much as you’d like with Brian. If you can’t pay the market penalty, (you don’t have any resources/commodities) – is there an alternate penalty or do you skip the penalty? Linda: I think you’re referring to a penalty like one that says, “Every time you roll a 4, lose a commodity or resource.” If you have no commodities or resources and you roll a 4, nothing happens. That’s actually how you can protect yourself from that penalty. Ok, but what area? the area where the tunnel begins of where the tunnel ended? Loris: Hi! That’s referring to the faction who controls the tunnel that worker is on. So if you’re on the blue Subterran tunnel, you would look at a market in Subterra. By reveal, does it mean show it to everyone or build it? Just show it to everyone. Did you consider scaling the lengths of the the tunnels and allegiance tracks for different player counts? I find that games with fewer players don’t really stand a chance of finishing tunnels or maxing out more than one allegiance track. Ian: That’s a good question. I think it’s possible for tunnels and allegiance tracks to be finished in any game; it’s moreso a matter of how focused players are in making that happen. I think it’s possible that the miners could start a 2-player game a little further down the track, but I personally wouldn’t play that way. You’re welcome to try! Question: can you use the worker activation tank when you already have four workers? You wouldn’t get another die, but could you do it to spend energy to lose knowledge/spend water to gain morale? Hi Ron, thanks for your question. You may use the worker activation tank even if you can’t gain the full benefit. Greg–If there is an action space that has a cost, you have to pay the cost to place the worker there. Jamey, first off thanks for the quick response in getting to me my missing blue face shaped knowledge token (FSKT). Secondly the FAQ question of Tunnels.. Recruits of the faction digging the tunnel are activated. I know what you meant there but my rules lawyer friends make it out to be the faction of the Dice Worker last played and activates the 6th space (I.E for example the initial Icarites face up recruit faction player that placed the worker. I know it sounds strange but so are my friends). I also know the color of the cards match the faction of recruits flipped (actually the color of the flip arrow icon). P.S. Sorry for such a weird and convoluted question, not really a question more of a clarification of sorts… Thanks Jamey, keep up the amazing work!! Hi, thanks for your question. I understand now where the confusion is coming from. Each of the tunnels has a label at the beginning of it–for example, the tunnel that starts in Euphoria is labeled “Euphorian Tunnel”. That label tells you the type of hidden recruits that are activated when the miner meeple reaches the 6th stage of the tunnel. Tuscany is in the works! We’ve been blind playtesting it for a few months now, and I think we’re looking at an early March Kickstarter. Thanks, Jamey! I can see on my own game board it does call ownership to the 3 tunnels, even though I know the ownership. I can not wait to spring this on my RL (rules lawyer, not real life… Lol) friends. My pleasure! I’m glad I could clear that up. I unfortunately missed Euphoria KS :(. But I am very happy with the retail. I think the 1x, 2x, 3x card is fine but in my first game with 3 players and we got all confused when the dog bumped the table and all tokens shifted… Lol. I think I would just prefer more components. Is that something you can provide in your store? BTW really appreciate the quality, mechanics, and themes in all your games!! I have a couple rules questions for you. I don’t have the game in front of me, so I won’t have all the card/market names, but I figure you will know them from my description. I had missed out on the construction of the market that prevents you from using your recruit special abilities. So I went to the artifact market that let’s me place a star on a constructed market to remove the restriction and discarded two matching artifacts. I had a recruit that said when I place a star from using a market, I can place another one. Does placing on the market to get rid of the disadvantage enable my recruit powers letting me place the second star immediately? Also, when the allegiance track moves into the “gain an extra resource” spot (2nd square) do you gain the extra resource with the worker placement that increased the track to that level? Lastly, my group needs to play the game some more to get a good grip on it, but it seems that someone getting two of the same recruits at the beginning of the game is very advantageous. It really lets them focus on one allegiance track and can give them an easy placement of 2 stars. We’ve been thinking of house ruling it that at the start of the game, each player receives a random recruit from each faction. They would still get four recruits and pick two, but it seems like this way it will spread out the allegiances that people target. Thanks for a great game, and for what I’m sure will be a prompt response. Hi Martin, thanks for your questions. There are a few recruits that let you place a second star right away if you pay a special cost. Those bonuses apply to constructed markets and artifact markets. You can still only have a maximum of 1 star on a constructed market, though, so there needs to be an available space on the nearby territory star. When you reach any new tier of the allegiance track, you don’t get the bonus until future turns. I wouldn’t suggest playing with that house rule. There are big advantages both ways. For example, remember that you only get bonuses from an allegiance track if you have a recruit of that faction. So if you only have recruits of one faction, you get half as many bonuses. I think the key to the recruits is to find recruits that work well with one another. how does a variant become official? Just curious. I like the idea about doubles using moral. jwspiker: After lots of testing. :) You’re welcome to try it out to let me know what you think! Hmm, maybe I wasn’t clear enough on my first question. It was a Wastelander recruit, but the problem we ran into is when the market restriction for not participating in its construction was lifted. Does that market restriction keep the recruit’s power disabled through the whole turn, or is the disable lifted as soon as I place a star on the market? You do only get half as many track bonuses, but it’s usually only in the mid to late game that you are able to flip extra recruits anyway At that point getting extra stars down is much more valuable. It is much easier to get one faction to the end of the allegiance track than two. Every game so far, the person that got two of the same faction in the opening 4 recruits has been able to pull off a win. Sometimes it’s a close one and sometimes it’s a blow out, but the double up has always been there. Granted, it’s only been 5 or so games so far, but it seems like having only one faction to worry about lets you focus all your effort and speed up the results. Martin: Ah, I see what you’re saying. It depends on the recruit’s ability. Which recruit was it? We plan on trying out 4 faction starts next time. I’ll let you know how it works out. It will be a bit more work in set up, but we will see if it changes the results. Cool. Yeah, for Jacko, you have to pay the cost when you place the worker, so at that point you’re still subject to the penalty. Oops. Makes sense. All placement (visit) costs must be paid immediately upon the visit. I probably still would have won as I’d built a large lead on the back of 3 Wastelander recruits and many markets. Can a player go down to only one worker? We had a game today where someone had a recruit card that said they could sacrifice a worker to place a star after they place a star. The rules don’t say that there is ever a minimum so we ruled that he could do that. That card seems too powerful but it could have been just played well. Thanks for your question. You can see the minimum number of workers noted on page 10 in the “A Few Notes About Recruits” section: “Some recruits allow you to sacrifice workers. You may not use that ability if it would result in you having 0 workers.” So yes, you could go down to 1 worker, just not less than 1. Chase the Miner – Can a player use both abilities in the same turn? Place a worker in the activation tank which allows immediately rolling and placing the new worker on a tunnel. Thereby gaining the regular benefit (Resource and/or Card) and choose sacrifice that worker to gain an additional two resources that tunnel provides? Jonathan the Gambler – What happens with his ability in the event of the Breeze Bar which grants a double card draw? Can’t activate at all because of the single icon pictured on the recruit card, draw 3 at a time for each of the two, or draw two extra and pick two? 1 Morale Worker Retrieval – I know it explicitly states that you can retrieve any/all workers for free if you have only 1 morale, but I just want to confirm that players can still do so even if they have the food available to pay for the option. Chase the Miner: Yes, both of those things can happen with this recruit on the same turn. Jonathan: His ability only activates once for one of the cards. So you would draw 1 card as normal, and then draw 3 for the second card, keeping up to 3 of those cards if they match. Thanks Jamey, as always your incredibly prompt reply to every imaginable question related to your games is just amazing. You’re setting the highest bar our hobby has ever seen for designer/publisher responsiveness. @Jello-Sweaters: Thanks for your question. You don’t gain the benefits of that recruit until the following turn since he’s technically activated at the end of your turn. It’s similar to activating the first-tier bonus of the allegiance track on a commodity area–you don’t gain the benefits of unlocking that tier until future worker placements. Thanks! Awesome, thanks! Loving the game! Quick question from our most recent play of euphoria. We had a player with all four workers and max worker int. he rolled the four dice for a total of 22, so he lost a worker. The problem was that after losing his 6 int worker, his total for the roll was still 16. Can you lose two dice from one roll ? He was trying to get doubles in order to win his next turn. Mike: Good question. You can lose a maximum of 1 worker per roll, so it sounds like he should have won. Can I use Brian the Viticulturist power (food for bliss) on market where I could pay food as well? Like in some of the market where you pay 1 of the 4 commodities and 1 specific artifact card. James: Sure, as long as you use food in place of bliss on your turn, you can move the Wastelander allegiance track forward one time with that ability. Does it means that I have to place them at the same time or in 2 separate actions? Or only 1 action? Let say I’ve roll a 3 on both die, if I place it on a commodity area to have the benefits of having a score of 3 (considering no one was there before) then place my second 3 to have the benefits of having a score of 6? Thanks and thanks for this awesome game! Fern: Thanks for your question. You would take 2 consecutive actions in that scenario. Thus you would place the first worker, pay the cost (if necessary) and gain the benefit, then place the second worker. Thanks! Can you go down to 0 morale/knowledge, or 1 in the minimun? Diego: 1 is the minimum, but you can continue to retrieve workers for free even if you’re at 1 morale. I just played a few games with my 7 year old son who really enjoys the game – he seems to lap up whatever games I put in front of him. He’d watched a game all the way through first which was a really big factor in him both wanting to play and understanding what it was all about. I gave him a head start with an having an extra face up recruit at the start – what other ways can you think of to give help/handicaps when playing with less experienced/younger gamers? this seemed to work pretty well with me winning the first game by 2 turns and then he beat me by 1 turn. Barry: I’m so impressed that your 7-year-old can play Euphoria! You must be a good teacher. A less experienced gamer could start with some resources/commodities. Also, I always recommended that less experienced gamers just try to do the thing their recruit tells them to do while they get a feel for the game. Thus I probably wouldn’t recommend having more than one face-up recruit at the beginning. That’s a good idea about handicap rules. If there’s room in the rulebook, I’ll look into something like that. Hi, I love the game! I started with the recruit “Jefferson the Shock Artist” in a game yesterday. The first time I retrieved, I used [power] rather than [bliss] and we had a quick discussion about whether I should gain the 2 morale as well as the benefits he grants (gain 1 morale and lose 1 knowledge) for a total gain of 3 morale. Can you clarify if what he gives is instead of the normal benefit for paying [bliss] or [food] or if they are cumulative? Thanks! Matthew: That’s a good question. If you use Jefferson’s power, instead of gaining 2 morale when you pay to retrieve, if you use energy, you lose 1 knowledge and gain 1 morale. Jamey, when using Jefferson’s power and paying an energy, must you have at least 2 knowledge (so you have one to lose) and/or no more than 5 morale (so you have one to gain) in order to use this privilege? In the rules regarding morale chart and knowledge chart is states “if a recruit card give you the choice to lose morale in exchange for a benefit, you must have enough morale to make the exchange.” But, in the case of Jefferson’s power, the use of energy is the cost and the gain of 1 morale and loss of 1 knowledge are the benefits. So, can you be at the 1 position of knowledge and still use this benefit? Doug: Thanks for your question. That’s correct–on Jefferson, those two things (losing a knowledge and gaining a morale) are a benefit, so you can use his power even if you’re at 1 knowledge or 6 morale. If the only place to put a star in the Icarites terretory is filled so no star can be placed, can you still get the Artifact card benifit when you put a worker on the Wind Saloon or Nimbuus Loft? Thanks for your question. You can only get the third-tier Icarite bonus after you place a star, so if you can’t place a star, you can’t get that bonus. You can still advance the allegiance tracks as you noted on page 9 by visiting places like the Wind Saloon or Nimbus Loft. You can only get the SECOND-tier Icarite bonus after you place a star, so if you can’t place a star, you can’t get that bonus … of drawing an Artifact Card. I have a question about the “Jonathon the Gambler” recruit card. The player that had this card as a recruit, read into the wording “matching cards form that draw” as to include the cards she already possessed in her hand with the cards that were draw for keeping a matching card. Meaning if she drew 3 different cards, but one of them matched another card in her hand, she kept that matching card to her hand card and discarded the other two. Does the “matching cards” only apply to the 3 cards that were drawn to be kept, or can one of the 3 drawn cards matching one in you hand also be kept? But the question still remains though, does the “matching cards” only apply to the 3 draw cards? Lawrence: Thanks for your question. The wording “matching cards from that draw” is very specific so that you only look at cards from that draw, not at all cards in hand. Compare this to Geek the Oracle, who specifies that you discard a card from hand. So for the new Gambler, you’re looking at all cards in hand, including those you just drew. OK to be clear, the old gambler “matching cards” only applied to the 3 [Artifact card]s that were drawn. The new gambler was changed to draw 2 [Artifact card]s and the “matching cards” applies to all the cards in person’s (that drew the cards) hand including the ones drawn? I went back and re-read the update and saw it was changed to draw only 2 [Artifact card]s.
Thanks for your quick response, I will be teaching this game at a party this weekend and I do not know if I can print/use the updated cards yet. I did back the Treasure chest KS so I am eagerly waiting for the updates to arrive with the cool resources. I have read thru all the updates and I would like to offer suggestions of wording on two of the cards (Brian the Viticulturist and Geek the Oracle), and I still need clarification on one other (Michael the Engineer). Since a person can use [Food] or [Bliss] to retrieve workers, the first part of the card sounds like it can apply to the retrieve worker action. I am also confused of the phrase ” When you do this at least once”, does this mean you get the recruit bonus each time you use [Food] in place of [Bliss] multiple times, or is the recruit bonus ability used only once per turn? Michael the Engineer- “When you place a worker on a construction site, you may use any type of resource. If you use [Gold], gain [Moral] and gain [Knowledge]. Some construction sites require [Gold] a resource, does this mean if you use [Gold] on a [Gold] construction site one time use action space you have to gain [Moral] and [knowledge]? Lawrence: That’s great to hear that you’re teaching Euphoria this weekend–thank you for doing that. For Brian, that actually changes the meaning, as there are other places in the game where you can replace bliss with food. I like your Geek suggestion–I’ll look into it. That’s correct about the Engineer. He’s a very powerful card, so this is our way of reigning him in. That sheds new light on Brian the Viticulturist, that brings up another question and let me see if I get the full meaning. If Brian the Viticulturist (You may use [Food] in place of [Bliss]) was an active recruit, and Amanda the Broker (give another player [Bliss]) and/or Gidget the Hypnotist (when you pay [Bliss] to retrieve workers) are also an active recruit, does that mean a [Food] can be used in place of [Bliss] to use their recruit abilities? If I keep this these questions up pretty soon you will be naming a recruit card after me, “Lawrence the Nitpicker”…. haha. HI! We tried playing our first game and everyone had questions. I am sorry if these have been answered somewhere already. 1) Can you place more than 1 Star in a star-shaped territory? Therefore in a 4 player game placing 2 stars in the Icarus Territory essentially blocks an opponent from getting Authority in Icarus? 2) Each player can only have 1 Star in a Constructed Market, and Constructed Markets are the only Markets that you can place Stars on? So you can not place Stars on the Artifact Markets or on the already constructed Markets in Icarus? Also you cannot place an additional Star on a constructed market via an Artifact Market, this only allows you to place one if you haven’t already? 3) if you can place Stars on the pre-built Markets (Icarus) is there a limit? 1) You can only gain Recruit cards: at set up (2=1 active +1 not), and via an Ethical Dilemma (IE:Read a Book). There are no other ways to gain Recruit cards? 2) If the above is true, then the max number of recruits a single player can have is 3 (whether or not they are active)? Hi Bob, thanks for your questions. I’ll do my best to answer them. 1. The only limit in the star-shaped territories is based on overall player count. So in a 3-player game, there are 3 spaces available in each territory, and you could place your stars in all 3 of those spaces if you get to the markets before other players. 2. That’s correct, the only markets you can place stars on are constructed markets, and only 1 per player. 1. Correct. Thus the maximum number of recruit cards you can have is 3. 1) It says you can trade resources/commodities. Are there any restrictions to the number of trade actions or when you can do them during your turn? If not, then is it possible to trade for a commodity in order to place a worker and gain Artifact cards, then trade Artifact cards for something else? Also, is bribery ok as well? – I’ll give you (A) if you help me build (B) or help dig tunnel (C), for example. 2) To confirm, trading actions, or activating your dilemma cards do not effect normal turn actions: placing or retrieving workers? 3) Also to confirm – Recruits are activated whenever a tunnel is built or an allegiance track is advanced far enough for the specific action. It doesn’t matter who’s turn it is? And once a faction or tunnel is advanced to this point, all future recruits can be instantly activated? For example “Player A” advances the meeple to the activate recruits placement in the Wasteland Tunnel, “Player B” instantly activates his inactive Wasteland recruit. Then, on “Player B”‘s turn, B plays his dilemma card “Read a book” gains another Wasteland recruit and instantly activates it. Is this correct? 1. Nope, there are no restrictions to the number of trade actions or when those trades happen during your turn. Bribery is allowed as long as the bribe includes things in the game. I wrote a more robust section on trading in the v2 rulebook, which is the one posted on the Rules section on this website. 2. If you use your turn to active an ethical dilemma, that’s your entire turn. Trading is part of a regular turn (you can still place or retrieve workers on a turn when you trade). 3. That’s correct, it doesn’t matter whose turn it is–all recruits of that faction are immediately activated, and any new recruits added later of that faction are activated instantly. Your example is correct. Bob, the first time I played the game I was wondering about the limited spots in the star territory also. The extra usable spots in the territory are covered/marked off down to how many players there are playing. It felt like if someone put more than one star in a star territory that I was getting blocked and would run out of places to put stars. The reality is there are plenty of spots in other star territories elsewhere to put stars. The only advantage in playing a star in any particular star territory is to gain a faction point for that faction. So if someone put more than one star in a star territory then the allegiance point moved up the same amount as if you played a star in that territory. The cost to put a star in any faction star territory is the same, therefore the strategy is to pick a territory that no one else is needing to advance the allegiance. If you miss out on one faction you can always use another, there are no passive bonuses in having a star in any particular faction’s star territory. I understand now. however it would be easy to block players out in 4+ games if two players were to place more than one Star in the Territory areas – pressuring players to Build Markets faster. It would also mean that players could focus on advancing the Allegiance tracks in order to place Stars on recruits, but would not gain the additional benefit of placing a Star each time. Additionally, using multiple workers to build a Market (lets say you roll doubles) puts pressure on others by applying restrictions until they successfully place a Star on these. I haven’t played enough to state whether these are good strategies or not, just trying to understand all the mechanics and how impacting actions can be on others. Does this mean : A) You cannot use the activation tank to get a new worker if you have 2 or 3 already while you are subject to this penalty. or B) You cannot add workers to spaces on the board if you have 2 or 3 on spaces already during this penalty. Thanks Sarah! Option A is correct. Question re: The Archaeologist (I forget his name): if I gain [BRAIN] [BRAIN], I can get an extra card, and dig twice. If I have unlocked the second tier of the Wastelanders, does that mean I get two cards and one clay? Thanks for your question. You are mostly correct. You’re not really digging twice, but you are moving the miner meeple two spaces. The benefit for using the Archaelogist ability after you’ve hit the second Wastelander tier is as you indicate above: 2 cards and 1 clay if you have an active Wastelander recruit. Whoops, yes, I meant “move the miner twice”. All good! Regarding the Market Draft Variant: Do you select your 1 of 2 markets at the same time you select 2 of 4 recruits. In other words, are you are looking at 2 markets and 4 recruits at the same time as you make your choices? Damon: Thanks for your question. Following the setup rules, you pick your recruits first, then do the market draft. Thanks Jamey. My wife and I have been on a worker placement kick lately, and for many of the games, after 5 plays or so I fell like “yup, seen all there is there,” and traded them off A few have stood out in that repeated plays have made them open up rather than shut down. Alien Frontiers, Carson City, Tzolkin, Dungeon Petz, Dungeon Lords, and Euphoria have all survived a purge that has culled many others! I’m looking forward to Viticulture. Damon: I’m glad that Euphoria made the purge! :) Tzolk’in will always be in my collection too. I haven’t tried Carson City–I’ll have to give that a look. I’ll probably always keep Stone Age and Fresco in my worker-collection category as lighter games. Does the second edition of euphoria come with the wooden stars? Seth: Indeed it does (see the last line of the first paragraph on this page). Thanks! I’m confused about the knowledge/morale draft variant and how its balanced. It seems to me whoever picks first has a clear advantage that isn’t balanced out over the course of the draft. Is it supposed to snake in the end so last pick in the first round gets first pick in the next round? Or is the player who picked first supposed to go last in the subsequent game. Could anyone clarify this? Thanks. Dan: That’s correct, so the player who chooses first will also get the very last pick of all players. That’s the balance. I got the game through KS and got the “Supreme” version. I am just now getting the opportunity to open and play it. However, I have 8 dice per person, but the rules only allow up to four workers, and I have an extra set of recruit cards. Why to both of these? Why do I have these things that I can’t use in the game? Am I missing the point? Stephen: The extra dice and alternate art recruits are completely extraneous–they’re not used in the game at all. We created the “supreme” edition during the Kickstarter campaign when many backers requested extra dice (gamers like dice) and alternate art recruit cards. They don’t impact gameplay at all. My game came with 8 little discs with commodity symbols on them. What are these used for? Ronald: Those are the faction bonus markers. When the allegiance track for a faction reaches tier 1 or tier 2, they activate a new bonus for players who have active recruits in that faction. You put the little discs next to the appropriate area (i.e., the Farm for the Wastelanders) to remind you to take the bonus when placing a worker there. Sorry if the question has already been answered. If I have 2 specialist who give me bonus when I sacrifice 1 worker. Do I get the 2 bonuses for 1 loss, or do I have to choose one of them ? 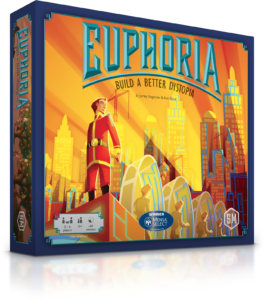 Would I be right to say that the second printing of Euphoria is the same as the supreme edition on kickstarter+ updated cards? Aaron: Not exactly. The second printing has updated recruit cards and wooden stars, but it does not have the following elements in the supreme edition: realistic resource tokens, black and white board, alternate art recruit cards, extra set of dice. Anyway, so I can say that the supreme edition has everything the 2nd print has? Your comment is right above my comment. :) The supreme edition has everything the second printing has except for the 16 updated recruit cards. Hi, if I have dices with the same number. Do I have to put them together on a multiple zone, or one by one. ie . with two dices of 4, do I place one die and take the bonus according to the number, and then place the other die to take the other bonus of the dices in the zone ? If, at the beginning of your turn, you have more than one die with the same number, you may place both of them on your turn. You place them individually as you wish (as if you were taking 2 turns back-to-back). So, you would pay the cost to place the first one (if any), gain the benefit, then pay the cost to place the second one (if any), then gain the benefit. It seems like you touched on this in an earlier reply, but for clarity’s sake I am wondering: for recruits, like Prof. Reitz, who have abilities that read “… you may gain [X knowledge]. If you do, draw an extra [artifact card]”, can you not use that ability if you’re knowledge is maxed? Interpreting this statement: “When you’re spending morale or gaining knowledge as a cost on a recruit’s special ability, you must actually have that knowledge or morale to spend.”, I would guess not. You are unable to get that extra card if you just sit at the top of the knowledge chart. The verb “spend” here is confusing, as it makes sense for morale (which decreases), but less so for knowledge. That’s correct, if you can’t pay the cost to use a recruit’s ability (i.e., if you’re maxed out on the knowledge track), you can’t use it. Having Gary the electrician, is it the lucidity of the player or of a worker in place ? Scenario: Two players have one star left and both are Subteraneans. The allegiance track for subterranean’s is one space away from star placement for faction. By one of these players initiating the subterranean market they place a star and bump the allegiance track. Do they happen in a certain order or does it happen simultaneously? Is it a tie that goes to the tie breaker rules, or… since the player initiating the market would theoretically be placing an eleventh star, does that player win?? Nathan: Good question. That would be a tie, and it would go to the tiebreaker rules. Jamie, could you please make the moment with knowledge check clearer? I played Euphoria once few months ago, and it was very vague in printed rules (Russian version), then I came across your YouTube video explanation of the gameplay, and, again, that moment skipped :) Somehow, while playing without company I got an epiphany and it clicked (oh and rules summary page helped). But here I am now, getting ready to play again with my own brand new Euphoria, and I am stuck again. You say, that whenever I need to roll a die/dice, I add up the number on it to my active workers but not those put on the game field. What are these active workers? I can see, you differentiate those from backup workers that appear to be idle dice next to me. P.P.S. I wish there were more moral dilemmas in each game. Like, I’d love to have this pressure of Sophie’s choice every time. Tatiana: Thanks for your question. First, ignore any workers that you haven’t added to your work force. Also, ignore any workers that are on the board–none of those workers factor into a knowledge check. Whenever you roll dice, immediately after you roll them, look at all active workers (dice) that aren’t on the board. Add up their knowledge total. If that total is too high, you’ll lose the worker with the highest knowledge. Thank you Jamey (sorry for not writing your name correctly the first time, that Jamie Oliver is to blame :)) So, by the beginning of the game each player has two (active) workers and two backed up. Did I understand it right, and an activation process is done only once per worker – twice for a player, then? I don’t need to activate a worker each time I take him back from the board? No worries. :) Whenever you retrieve a worker from the board, have a worker bumped from the board, return a worker to your supply after constructing a market, or add a new worker, you roll it and do a knowledge check. Yeah, this I know, but I don’t need to activate him over and over again when the worker is anyway bumped from the board, right? The activation is needed for the rest two dice only? You only roll each die once when you do the things I listed in my previous comment. In a few turns you’ll place the die somewhere, and then you’ll probably retrieve it or have it bumped, and when you do, you’ll roll it again. Jamey, yes, I completely understood your comment on knowledge check procedure. My second question, however, was about activating a new worker in a Workers Activation Center. When I played the first time, I thought that in any case if a worker is retrieved from a board, he must be placed there for a new activation. Now I understood that only new workers (those who were dismissed after failing knowledge check and those who were not yet introduced to the game) must be put there. See, this is why my question with knowledge check showed up – I couldn’t understand your definition of a an ‘active worker’. It’s been cleared up, thanx! 1. I crossed the finish line of a loyalty tracker and put a star on the right recruit. 2. Few moves later I decided to play my moral dilemma card and chose to pick up an additional recruit. This recruit belongs to the same faction that I had starred. 3. Do I put one more star on the second guy? And do you have further plans on localizing your other games in Russia? Jamey, congrats on winning the top positions on BGG with Scythe! I saw a discussion about this on the BGG forum but I didn’t see an official answer. In the advanced variant where you place Morale and Knowledge one player after the other, shouldn’t the second round be played in reverse order? If both rounds are played in the same order, the last player certainly doesn’t get the best options. Bernard: Sure, that’s exactly how it’s stated in the rules (page 11). Really? That’s great. I actually read the rules in french provided on BGG, and it does not say that. Loosely translated it says : “Beginning with the oldest player and going clockwise, each player places either his moral marker or his knowledge marker on an unoccupied space of the corresponding track until all markers are placed.” It does not say that the second marker should be placed counter clockwise starting with the player to the right of the oldest player. But from what I understand from your answer, that’s how it should be played, and I’m glad to hear it. I recently bought the game and I’m having a great time exploring it! But I have a question regarding two recruit cards: Kyle The Scavenger and Jonathan The Artist. Do their abilities OVERLAP the costs/bonus of the original places? Or are they ADDED to the costs/bonus of the original places? I tried to find the answer in the manual, but couldn’t. The same question for Zong The Astronomer! When you place a worker, the first thing you do is pay the cost of the action on the board. Then the “when you place” ability on the recruit triggers (pay the cost and gain the benefit). After that you gain the benefit of the action. I have read good really good reviews, but I have been unable to find it in Spanish, and I was just wondering if Euphira is going to be available in Spanish in the near future. Manolo: Thanks for your question: I’m not sure which stores have it, but Euphoria is currently available in Spanish from Gen X Games. Theater of Revelatory Propaganda costs 4 energy + 1 clay. Does The Stadium Guaranteed Home Runs only cost 1 Random Commodity + 1 Baseballbat? That’s correct! The cost seems lower because it’s so specific–there are only 6 baseball bats in the game. So me and my friend were playing and we both finished out a faction and gained its star. He had 1 recruit in that faction but I had 2 but both of us played our 10th star by doing this, but i didnt have a star to lay on both of my recruits since I only had 1 star left. Would this mean I had 11 stars vs his 10 or would it go to tiebreaker rules. It would go to tiebreaker rules, as you only have 10 stars. Very close game! From the Ignorance is Bliss Expansion, the two “Unnoficial Variant” rules are now in the expansion rule book as what looks like rule changes. Are these still consiered unofficial variant rules? Or Errata? When you play with the expansion, you must play with those rules. When you play only with the original game, they’re optional (but recommended). Thanks Jamey. I understand from the exchange above that they are in the expansion rules. My question is where were these found as “unofficial variants” prior to the expansion release? Oh, sorry! They were mentioned on the last page of the Euphoria rulebook (more recent printings).